New adizero team jerseys represent the essential elements of national pride. TORONTO (March 2, 2016) – The National Hockey League (NHL), National Hockey League Players’ Association (NHLPA) and adidas today revealed the World Cup of Hockey 2016 uniforms, which will be worn by more than 150 of the world’s best players at the Air Canada Centre in Toronto from September 17 to October 1. The World Cup of Hockey 2016 features the following eight international teams: Canada, Czech Republic, Finland, Russia, Sweden, USA, Europe and North America. Each team’s jersey design is inspired by essential elements of national pride from the participating teams. Together, the jerseys create a unified vision of global hockey and will be available for purchase beginning in August. Made with adidas’ cutting-edge adizero technology, the new uniform features the blending of three lightweight, resilient fabrics, which have been tested and tuned over the past four years. Engineered for durability, while providing greater airflow, the innovative adizero fabric has been developed to keep athletes cool and comfortable. Additionally, the new adizero cresting reduces weight, adds flexibility and improves overall movement, allowing players to perform at their highest levels. Development and construction of the lightweight jersey has been refined to minimize nonessential elements including seams, piping and others that add weight to the jersey. Additionally, the collar has been designed to be more robust and durable and the lay-flat construction allows a better range of motion while simultaneously creating a clean look. Featuring a cut-resistant fabric lining made from Dyneema Diamond™ fabric, the game socks provide athletes Level 3 cut protection. Canada – Celebrating the designation as the host team for the World Cup of Hockey 2016, Canada’s uniforms recall a modern interpretation of the national icon—the maple leaf. The motif wraps each sleeve, creating a visual with a direct connection to a crowning era in Canada’s hockey heritage. The three veins contained in the Dominion Leaf crest represent Canada’s three coasts and make this a mark to represent all of the Great North. USA – Building upon a tradition befitting the land of the free and home of the brave, the USA uniform features bold striping inspired by service uniforms that creates a distinct yet cohesive visual across the uniforms. National emblems and banners inspire an unapologetic shield and word mark. Sweden – Focusing on Scandinavian sensibility, Sweden’s uniform uses bold assertive color blocking drenched in the national blue and gold. The emblematic tre kronor crest is appointed with kurbits detailing, an honored Swedish traditional motif. Finland – Paying homage to heritage, the Finland uniform design honors the bold Nordic cross of the Finnish flag. Reflecting the spirit of Suomi, the crests feature the national coat of arms with its crowned lion. Czech Republic – The Czech Republic’s uniform seizes upon the boldness of national emblems and banners. The statement color blocking highlights the coat of arms, a silver double-tailed Lion crest representing all of the Republic. Russia – Centered around the powerful double-headed eagle national shield, Russia’s uniform features the traditional crest surrounded by impact color blocking that carries the colors of Russia’s national flag. The uniform reflects a modern interpretation of the steadfast Russian identity. Europe – Signifying a united Europe, the players’ countries are all represented by a modern E shield, featuring a single crest that connects all of their home nations. Players wear their flag on their shoulder and the names of each European nation in the unity stripe across their sleeve. A continental blue color scheme highlights harmony on a unified team. North America – The North America team is a group of young talented phenoms who will play in black and white under an inclusive badge of brotherhood. The crest and uniform feature highlights of beacon red, signaling the high energy these stars bring to the ice. This uniform admits the wearer to the exclusive club of the next generation. 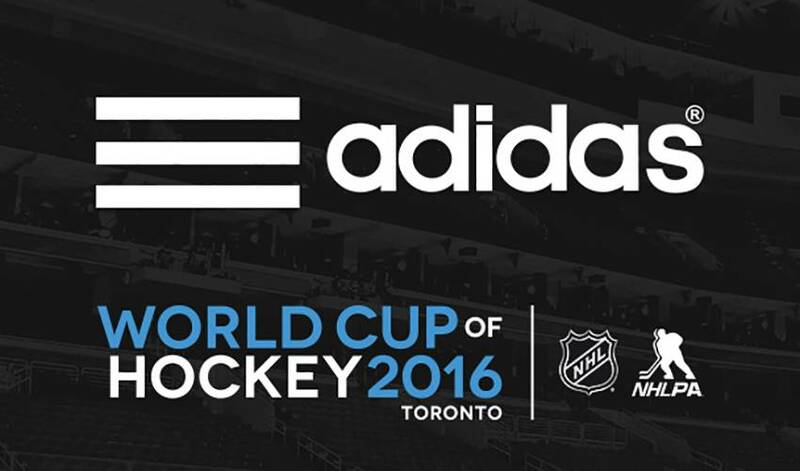 World Cup of Hockey 2016 uniform imagery is available to the media for editorial use at mediaassets.wch2016.com. For more information and images of the new adidas hockey uniforms, please visit http://news.adidas.com/US and follow the conversation on Twitter and Instagram via @adidas, @adidasUS, @adidasca, @NHLand https://www.facebook.com/adidas/ #WCH2016.